I have always enjoyed sports associated with water. I swim like a fish (well nowadays more like a stranded whale), and am just "at home in it, on it, under it, or with it. When I was 13, I learnt to sail, in a town in North Wales, called Pwllheli. Non Welshmen may blench at pronouncing it, so try "Poothelly". It's wrong, it'll offend purists, but it will do (and I'm not Welsh, so it's probably even more wrong!). I was captivated by the experience - the freedom, the movement, the balance, the power! it was something I could excel at. I bought a boat. It took most of my savings. It was a Merlin Rocket, like the one in the picture, and sailed it on the Thames, and on holiday in Pwllheli. it was a reasonably difficult boat to sail, and very exciting in strong winds. I ONLY like sailing in strong winds - for the sailors among you, force 5 on the Beaufort scale or higher. I am, of course, quite mad! Sailing led me to qualify as a Sailing Instructor when I was 17, and I spent the Summer and several summers from then onwards, working on an island in the Thames, teaching kids and a few adults to sail. One of these was Gordon, an inept youth, but an inspiration to us in a different way. Here I also learned to paddle a Kayak, and we went on expeditions at weekends to paddle down rapid rivers in Wales and Devon, and to go canoe surfing from beaches in Wales. I was the fittest I have ever been, lean, muscled, suntanned, bleached blond hair, and so single and unattached that I could have wept each evening. But then you have to understand more about me. In university vacations I still worked on the island, and also in Surrey Docks in a deprived part of London, as an instructor. After I failed my degree [idiot! ], I started work, and soon bought a Tornado catamaran. They are 20 feet long, 10 feet wide, 30 feet tall, and are capable of towing a waterskier! One heck of a boat. Well, I did say that I was mad, didn't I? I was never a competitive sailor. I mean I never really won any serious races. I was good at sailing, but no good at racing. 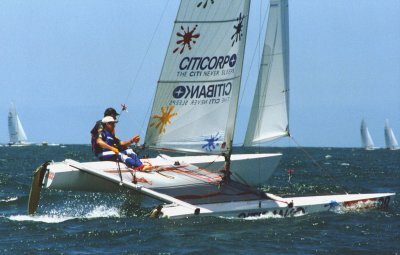 Often, in fun, I tell people that I competed in the UK selection trials to sail in the Olympics [the Tornado was then an Olympic class]. I was 18th in the line for the selection. The trouble was that there were only eighteen contenders for the job! I still enjoyed it, though. After I married, I tried to sail some more. I owned a Cherub - 12 feet long, and about three times as much sail area as it should have! It was hanging from the rafters in my garage for many years. Now I no longer have a garage it has had to go. Someone else is enjoying it. Sailing it requires intestinal fortitude and a change of underwear. Just my type of thing!! !